It was a little challenging to find but well worth it. The people gave us excellent directions as well. More fun than I expected. We really gelled as a team. We weren't able to solve it, but had so much fun anyway. I look forward to trying the next one! The Newsroom is buzzing. Everyone's working hard to make the deadline for the latest issue, and all that's left is the headline. The publisher is holding is the presses and waiting on your team. You have an hour to come up with a perfect headline. 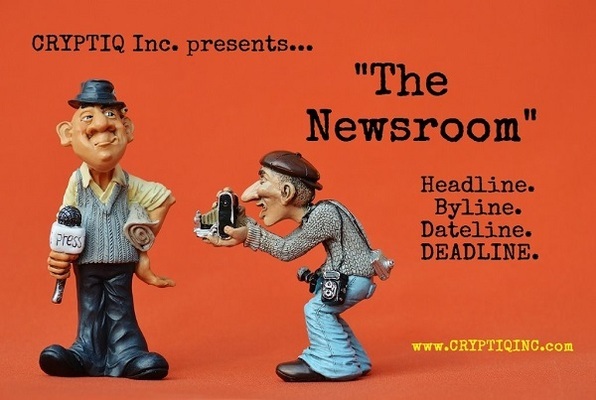 Complete your task and you’re headed for a Pulitzer, fail and you’re headed for a new job! Reviews of escape game "The Newsroom"
I loved this because it was a mom and pop escape room. One of the owners (the wife) was so passionate about how they came to be CryptIQ, which was great to see. The room itself was very challenging. We didn't escape, which was a first for us (not to be cocky!). We wound up loving the "we give you clues at our discretion" approach vs. 3 clues at your discretion. Great room. Not giving 5-stars because there was no WOW effect, but it was a very challenging, yet beatable escape room. This was my first experience with an escape the room and I am officially hooked. My group did not make it out but we were so close!! It was an intense roller coaster of puzzles, clues and mind games. Everyone in the group had different strengths and it was so much fun trying to put it all together. Grab a group of friends/family and go play. I guarantee it will be worth it. Such a fun experience!! There was so much excitement throughout the hour! We were ultimately found the key but ran out of time to be able to use it. We cannot wait for the next one!! You have got to try this….guaranteed a good time! It was very good, and my friends and I had a great time. I do think we were spoon fed the clues quite heavily though! This was my first escape room, so not sure if this is the norm.